Save the date, make the plans! June 8-10, 2012! Check out this video invite and visit the Alumni page of our website to register! NY Area Camper Reunion Invite! Check out the NY Reunion invite! This is a must read! This is what we have been talking about! This is why camp is important! Less than 250 days till the summer of 2012! 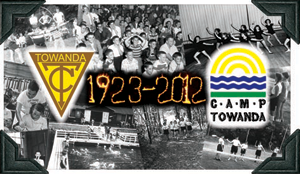 Our 90th year! Thanks to those who came to the Fall Foliage BBQ! Next up is our reunion Nov. 19 at Lucky Strike Lanes in the Palisades Center Mall, West Nyack, NY! Throw some strikes, watch the FNF highlights and don’t forget to pick up our new 90 year reunion candy bar! Construction is underway for the new gymnastic pavilion and our 3rd beach volleyball court! We’re already getting ready for the summer of 2012!